What exactly is in Vivix (besides resveratrol)? Rejuvetrol™, a patent-pending blend of resveratrol, ellagic acid & other potent polyphenols such as phenolic acids, ellagitannins, anthocyanins & proanthocyanidins. Contains Muscadine grape extract, trans-Resveratrol from Japanese Knotweed, European Elderberry extract, Purple carrot extract. No artificial flavors, colors, sweeteners or preservatives. Concentrated extract - not a juice! Daily serving delivers 100mg - the equivalent amount of resveratrol found in 100 glasses of high quality red wine. Shake well. Take 1 teaspoon per day with a meal. May be mixed with water, juice, shake. Refrigerate after opening.It is recommended that unopened product also be refrigerated to maintain optimal product integrity (color may dull if left unrefrigerated for extended periods, but product efficacy is NOT affected by this). Revolutionary breakthrough in the ‘fight against cellular aging’. Sourced from the only grape in nature that contains an extra chromosome which is thought to give this grape its exceptional qualities. This ‘super grape’, much larger than normal grapes, is the size of an apricot or plum. Contains ellagic acid (not found in ordinary grapes), a polyphenol with unique properties & the topic of much research in the field of anti-aging, as is resveratrol (the ‘good for you stuff’ in red wine). What issues can it help support? How is our Resveratrol (vivix) unique? Cold processed only. Not heated or pasteurized. Stays in liquid form throughout process - never dried down to powder form. Naturally preserved & stabilized. The Warehouse is refrigerated. A 30-day supply delivers the equivalent amount of resveratrol found in 3000 glasses of high-quality red wine. 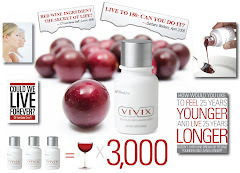 Studies show Vivix ingredients to be 10X more powerful in slowing the formation of AGE proteins (a key mechanism in cellular aging) than resveratrol alone. This unique patent-pending, all natural, Rejuvetrol™ blend ‘packs a lot of punch’ into 1 tsp / day. Shaklee scientists are at the forefront of anti-aging research. Vivix took years of scientific study & research to develop & is the most complex product in Shaklee history. making benefits of Vivix available exclusively from Shaklee. See shaklee.com for study details. Contains the most pure & potent (98%) natural resveratrol available on the market, meaning a 100mg serving actually provides 98mg resveratrol. Most competitors contain 50% or less purity. Serving amount of 100mg / day is guided by worldwide authorities & emerging research. Almost all Resveratrol products on the market naturally contain Emodin, a natural laxative, which causes many users to have diarrhea, lose weight, etc. Vivix contains NO Emodin. Contains zero sulphates - the substance in red wine known to cause migraines in those sensitive. Contains small amount of tannins - test slowly if sensitive. Usually sensitivities are due to sulphates or preservatives found in wine.